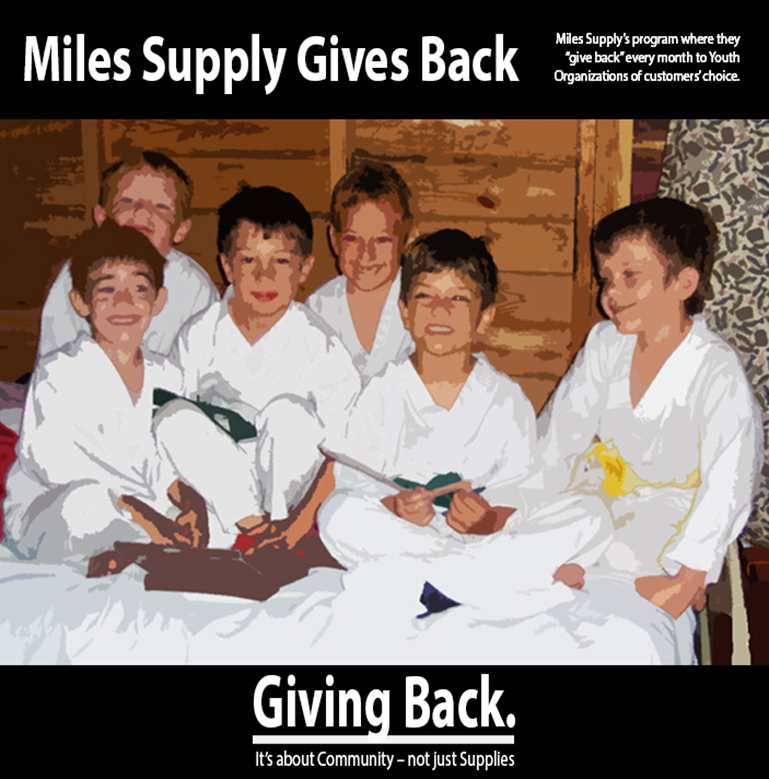 We are proud of our Miles Supply Gives Back program. It’s all about our youth and the activities they love! When polls are open each month, vote here! Winners will be notified and posted on our Blog on this website and on our Facebook page. 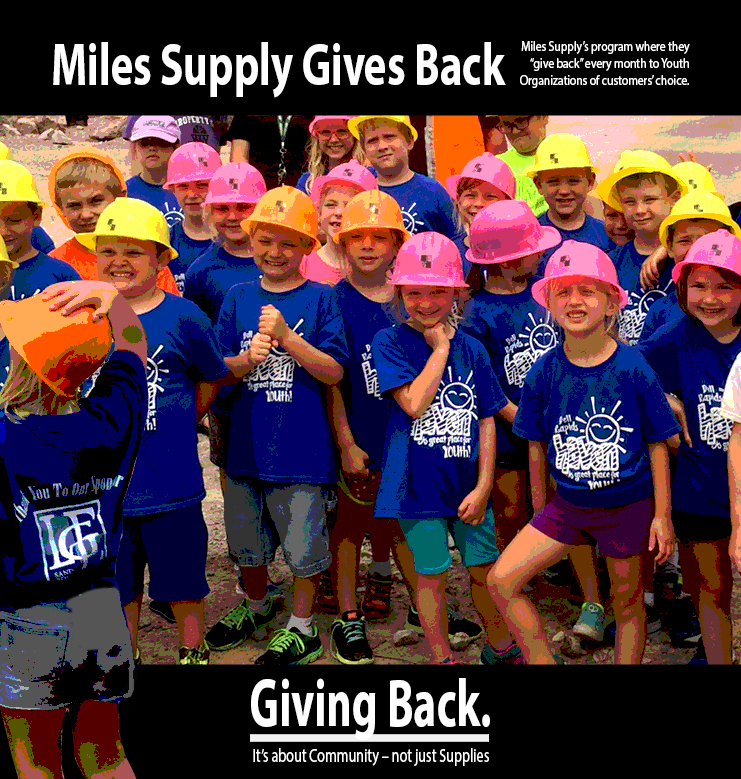 Our Give Back program truly describes the Miles Supply philosophy; an emphasis on our employees and our family. Sure we love selling products and machines, we enjoy meeting new people and spending time with friends we’ve known for years, but at the end of the day, we love to give back. We love to see the smile on a kid’s face. We love being a part of the community. 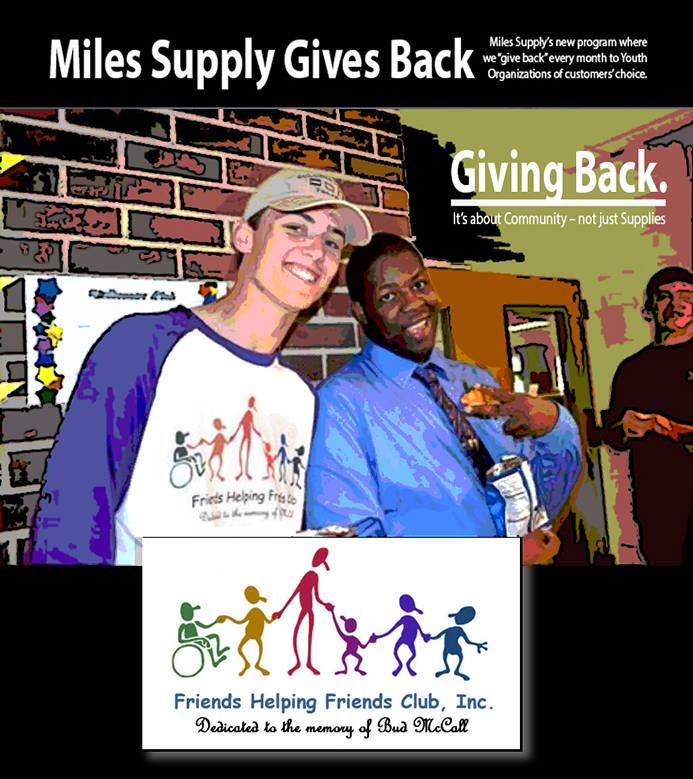 We’re really excited about Miles Supply Gives Back and the young people that will benefit in your community. Customers who purchased from us automatically entered into the program. Miles Supply chose 2 winning customers. The customers chose the youth program and we donated $500 on their behalf. We post all here, view all individual posts, and the list of customers & winners on our blog, and also on facebook the randomly chosen customers with their selections of youth programs. Winning customer Crandalls Memorials in NY chose the 4H program of Cornell Cooperative Extension of Allegany County in our MILES SUPPLY GIVES BACK donation program. To see info about the 4H program and Crandall’s comments view post. 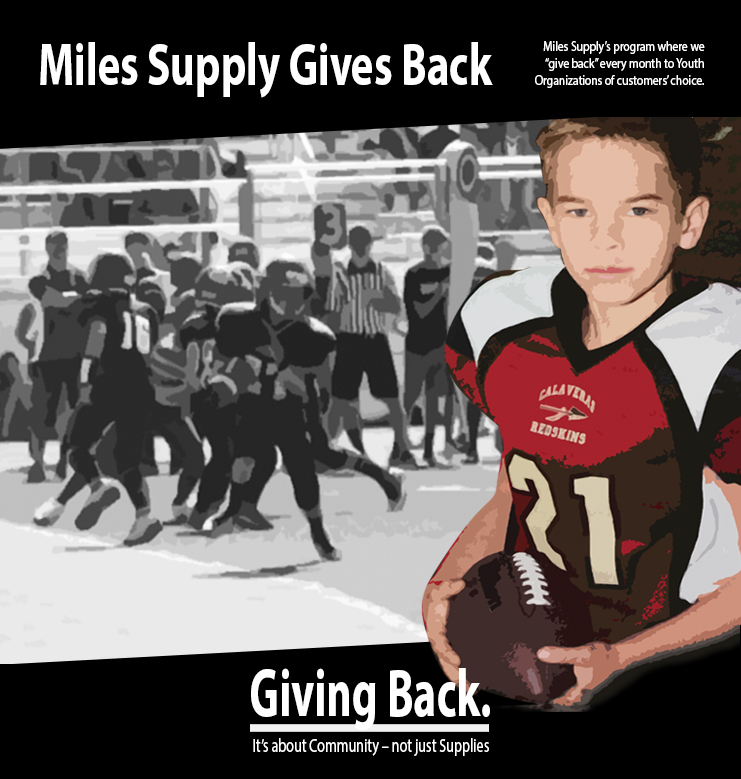 Winning customer Decorative Rock Network chose the Calaveras Jr Redskins as one of the recipients of our MILES SUPPLY GIVES BACK donations. Winning customer Harsha Monument Company chose their local Boy Scout Troop 290 in Seaman, Ohio to receive the Miles Supply GIVE BACK donation. 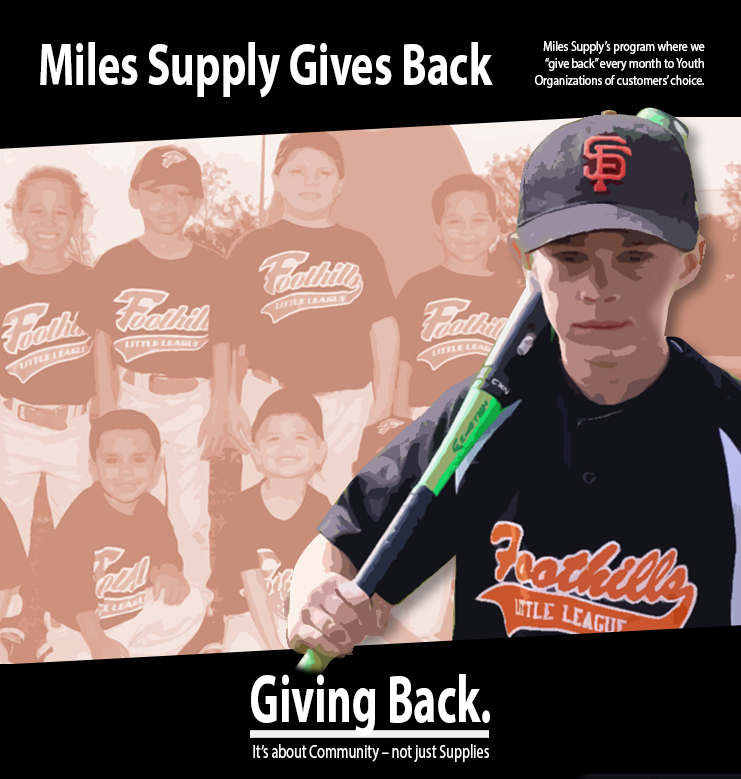 “Thank you for giving us the opportunity through the “Miles Supply GIVE BACK campaign,” to help our local youth organization. We have decided to have the proceeds sent to a local Boy Scout Troop in our vicinity. With summer camp approaching we’re sure that they will put this to good use. These boys work really hard to help the community grow around them with various community service and Eagle Scout projects. Examples of that would be flagging veterans graves for Memorial Day, busing tables for the American Legion during the summer and fall festivals, and helping out on a broader scale such as replacing the flag pole at a local cemetery, reseeding of Serpent Mound, and trail improvement at Adams Lake State Park. They also volunteer at Camp Oyo during Beaver Days, during which various maintenance projects are completed such as paintings walls, replacing windows screens, changing lights, removing down trees, fixing bunk beds, etc..
B & P STONE of PA is one of our winners! They chose a youth program called VICTORY KIDS to receive the $500 Miles Supply Give Back donation! 2017 marked the 63rd year in our family business which began with one focus, BUILDING RELATIONSHIPS! 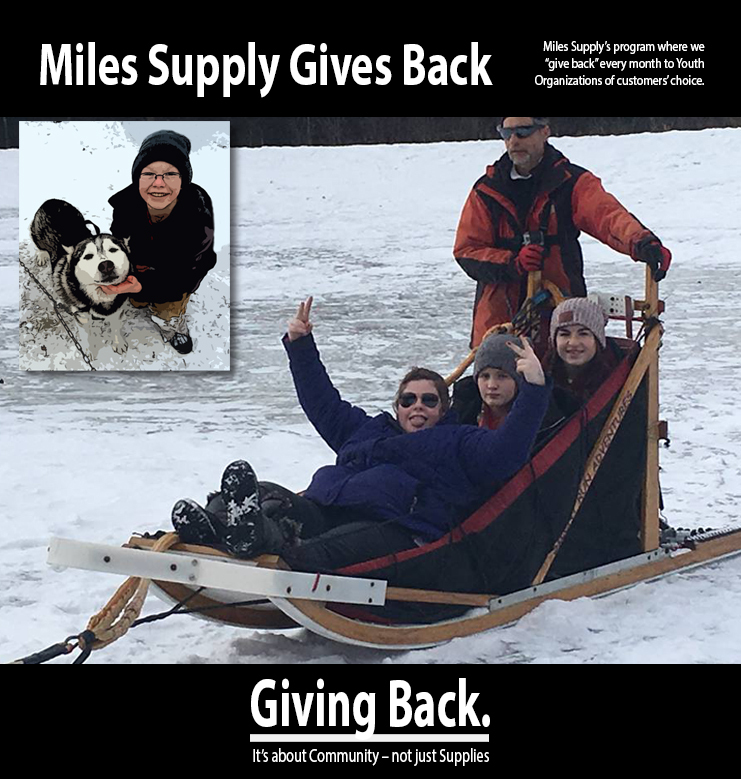 These relationships inspired us to GIVE BACK in 2016, with our Miles Supply Gives Back program. We are proud to say that we donated nearly $20,000 back to youth programs, chosen by winning customers each month, over the course of the year. Seeing the impact has been heartwarming! All of which was made possible because of your patronage to our company and the relationships we have created together. 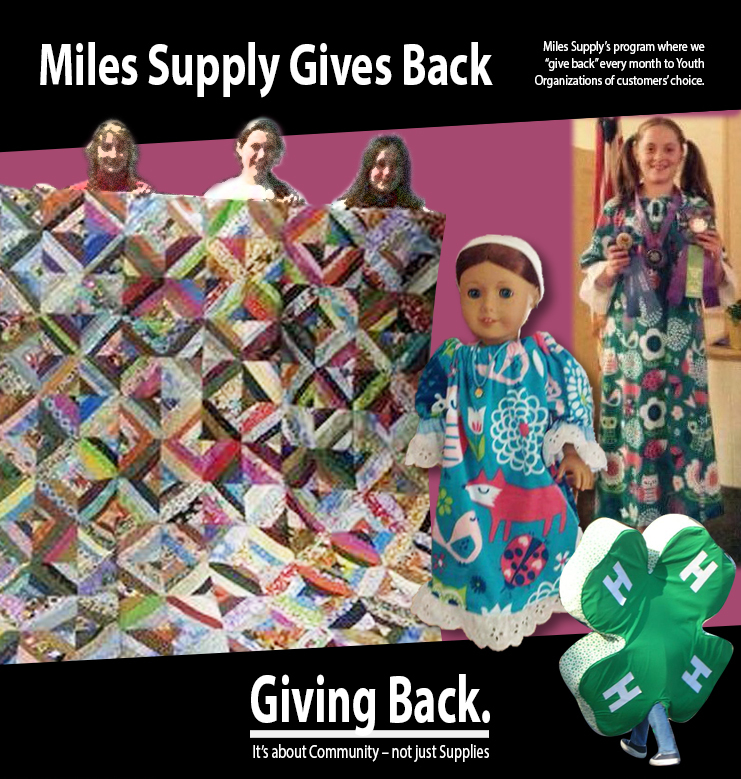 We are happy to announce that we will be continuing this Miles Supply Gives Back campaign into 2017! 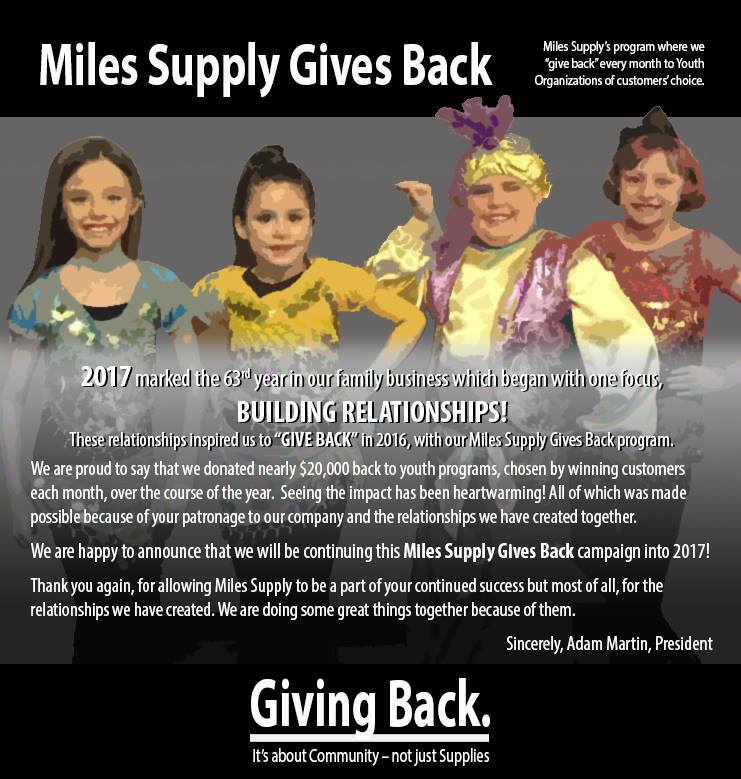 Thank you again, for allowing Miles Supply to be a part of your continued success but most of all, for the relationships we have created. We are doing some great things together because of them. 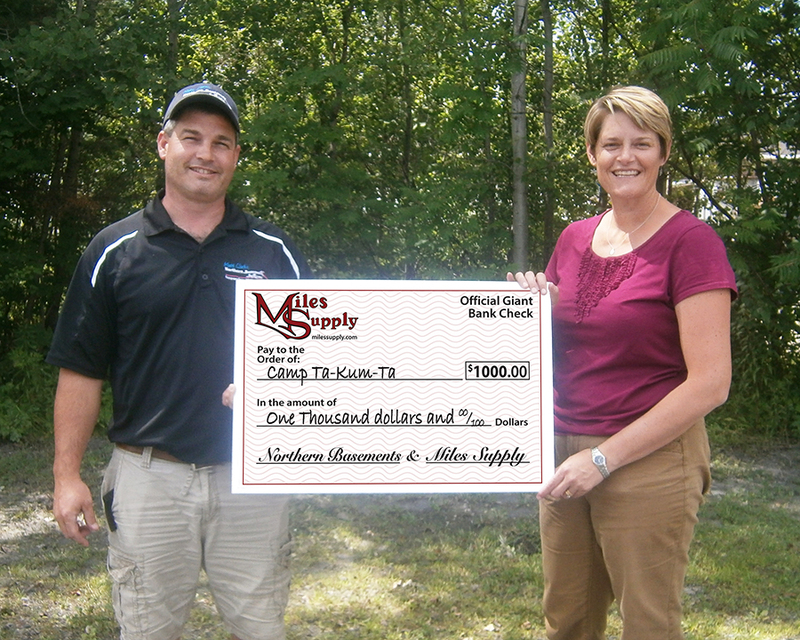 Winning customer Clifton & Clifton chose St. Jude’s Children’s Research Hospital to receive our MILES SUPPLY GIVES BACK donation. 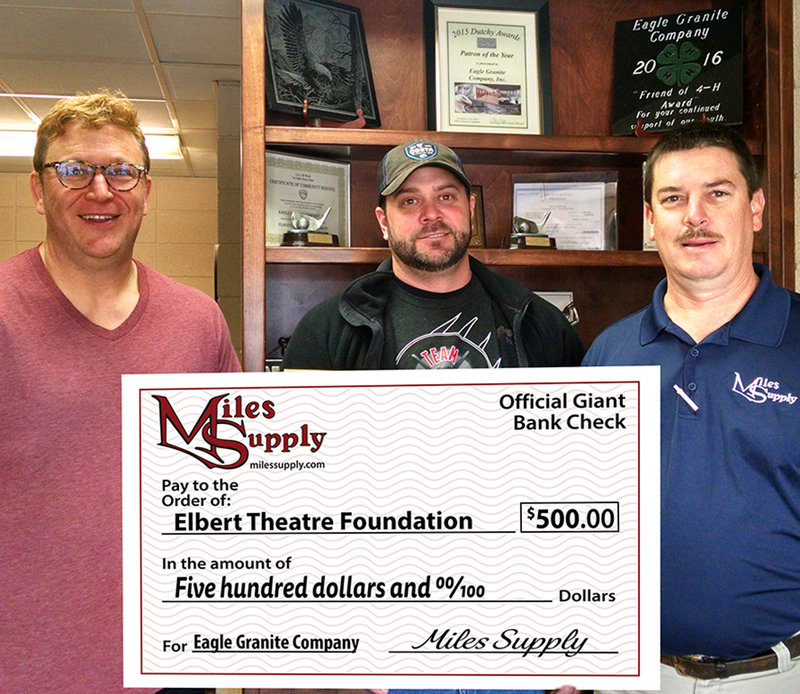 Eagle Granite Company of Elberton, GA is this month’s winner and they chose for their donation to go to the Elbert Theatre Foundation. The mission of the Elbert Theatre is to Educate, Enrich, Empower, Entertain. Eagle Granite presents the check – the background shows their record of giving in their community. • Karder’s Crew in IN thanks to Young & Co. Rock Art and Design! Ronald McDonald House of Scranton (PA) was chosen on behalf of winning customer Keystone Saw Shop in Pennsylvania. Offers families a free place to sleep, eat and relax while their children receive medical treatment at one of the area’s (PA) nearby medical facilities. Private Bedrooms, Home-cooked Meals, Transportation, Laundry Facilities, and Family Areas…. Double that Donation! Thanks to Matt Clark of Northern Basement Systems for matching their winning donation to Camp Ta-Kum-Ta! Winning customer Northern Basement Systems of VT chose Camp Ta-Kum-Ta as their recipient. They also matched our donation – doubling the benefit! Camp Ta-Kum-Ta provides challenging, extraordinary experiences in a safe and loving environment for children who have or have had cancer and their families. Camp exists on donations, at no cost to their families…. 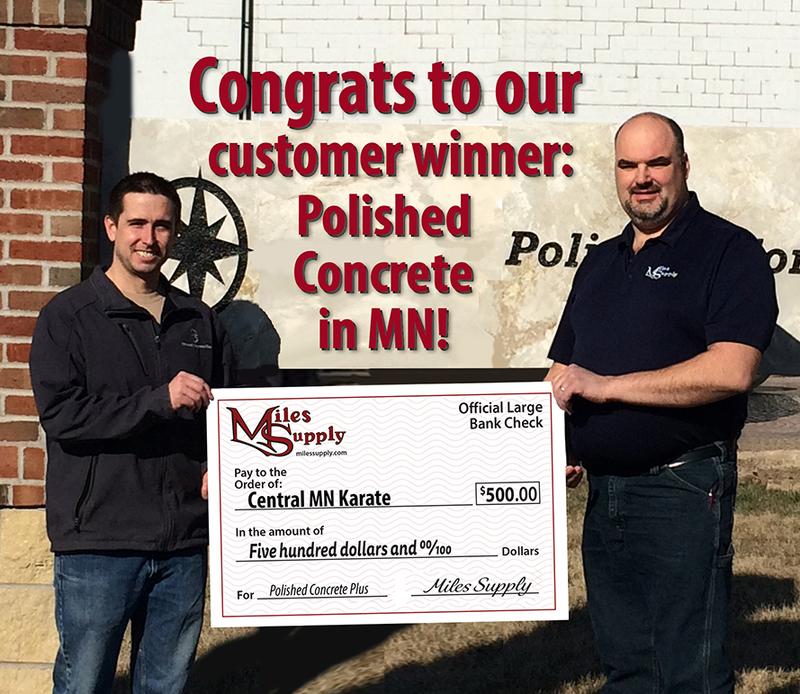 Winning customer Polished Concrete Plus has chosen Central Karate of MN to receive this month’s Miles Supply Gives Back donation. Central Karate acquaints children with an innovative method of etiquette which requires self-control and respect toward others. The physical and mental disciplines practiced in karate training have proved instrumental in developing strength, coordination, and endurance and also, excellent team playing skills, goal setting, and mounting self-esteem. Central MN Karate has been providing instruction, camps, tournaments and recreation to students for 40 yrs. Your contribution will be applied to families and students that are challenged to meet expenses in an upcoming activity. Friends Helping Friends in GA – thanks to Wallace Granite. 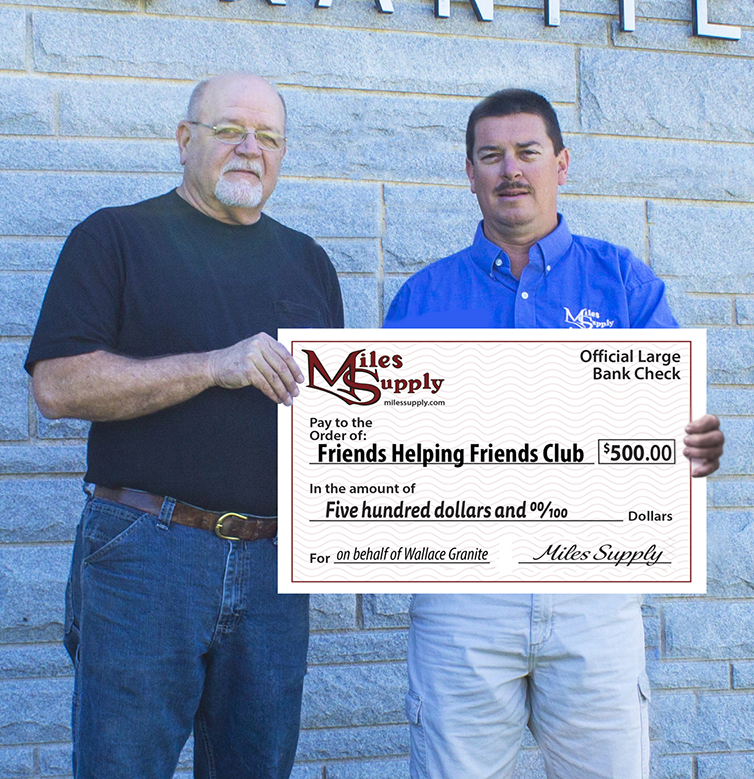 Winning customer Wallace Granite is presented the check from Miles Supply’s Mark Crook in our Georgia location. 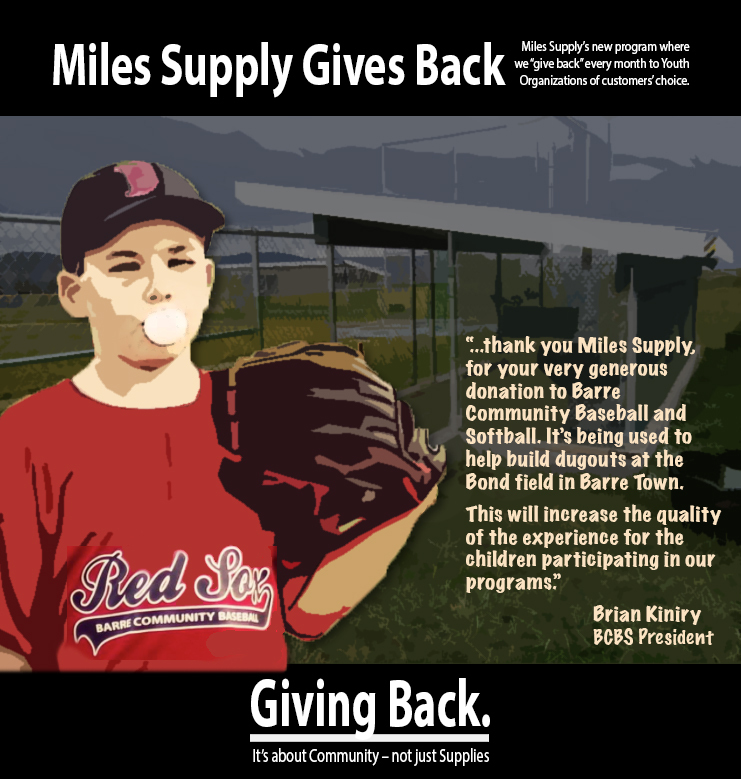 Barre Community Baseball & Softball from Miles Supply.